While the midsize-car field remains quite expansive in terms of offerings, few of them are station wagons. Also rare is the availability of all-wheel drive. It’s no surprise, then, that only one is an AWD wagon: the Subaru Outback. The Outback is such a rarity that there’s even room for legitimate debate about its classification as a midsize car. The elevated wagon body with 8.7 inches of ground clearance, the all-wheel drive, and driving aids like “X-Mode” traction-assist and hill-descent control could make this Subaru look like a crossover sport-utility vehicle to some eyes. This hair-splitting gets ever finer the more that manufacturers bend and stretch once-familiar vehicle types into something new. For instance, at Consumer Guide®, we list the Outback as a car but consider Toyota’s brand-new C-HR a subcompact SUV. The C-HR has a raised ride height, but solely is a front-wheel-drive vehicle; its cargo bay is wagonlike, but with a sloped tailgate like a hatchback. Its tall stance and black lower-body cladding give the Outback a rugged, outdoorsy feel. Roof rails, 18-inch alloy wheels, and a power tailgate with a memory height feature are standard equipment on the top-line Touring models. That’s enough semantics for one vehicle review. 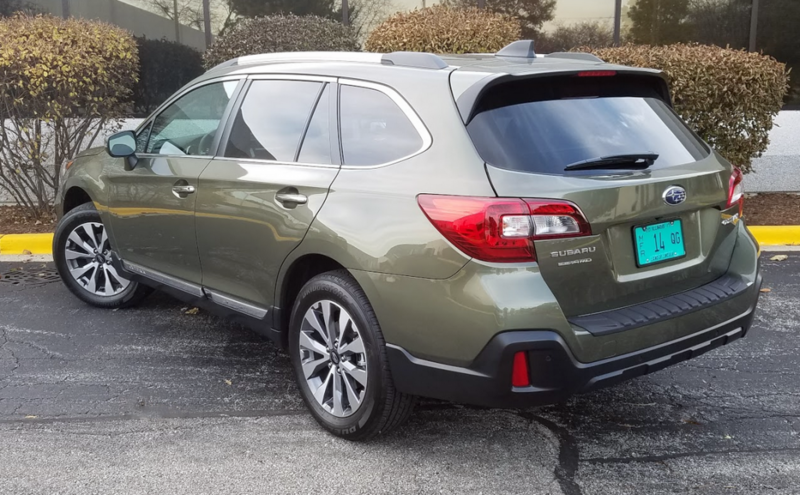 Back to the point, there is the 2018 Outback. It builds on its 2015-vintage platform with revised front and rear styling, redesigned mirrors and sound-insulating glass in the front side windows for a quieter interior, and the addition of Apple CarPlay/Android Auto connectivity to Subaru’s STARLINK infotainment system, among other things. The same two “boxer”-type engines are available, a 175-horsepower 2.5-liter 4-cylinder and a 256-horsepower 3.6-liter six. CG tested a 2.5i model in top-of-the-line Touring trim. Without options, it cost $37,405 delivered, which is $2200 less than the tab for an Outback 3.6R Touring. Indeed, there are no option packages for Tourings, just a number of stand-alone accessories. The Outback offers excellent room in both the front and rear seats. Four average-sized adults can ride in comfort. Standard features that set the Touring apart from lesser Outbacks include Java Brown perforated-leather upholstery with ivory contrast stitching, a heated steering wheel, GPS navigation system, steering-responsive LED headlights, and low-profile roof rails. Also added is the “EyeSight” suite of driver-assistance technologies, including adaptive cruise control, automatic pre-collision braking, and lane-departure and sway warning with lane-keeping assist. 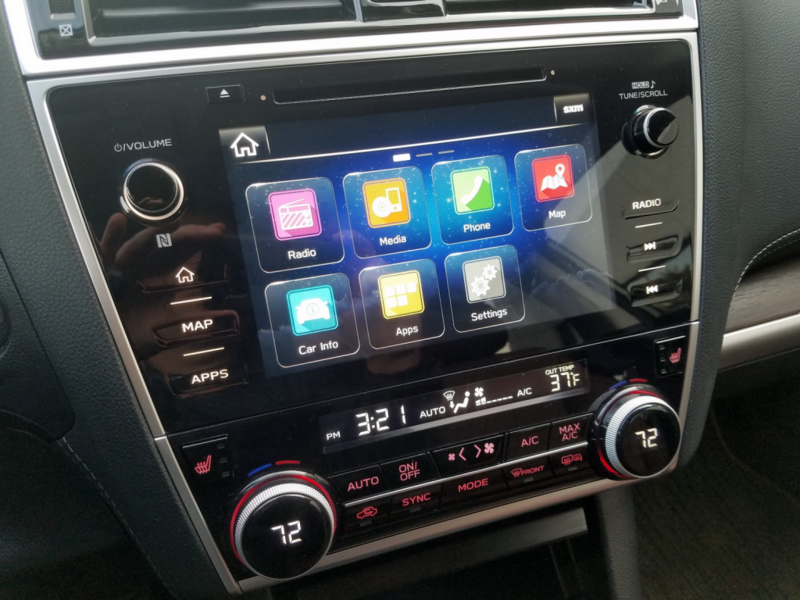 We like the simple, easy-to-use layout and large buttons of Subaru’s latest-generation STARLINK multimedia systems. You get what you pay for, enginewise, with an Outback. The costlier six provides fine power. The four, on the other hand, is just a little better than adequate. With a modest maximum of 174 lb-ft of torque, the Outback 2.5i suffers on the highway when a surge for passing is desired. The continuously variable transmission—the only trans available—doesn’t have a prompt kickdown like a stepped-gear automatic, so there’s no decisive leap forward, just a drawn-out sense of incremental acceleration. EPA fuel-economy estimates for the 2.5 are 25 mpg in city driving and 32 mpg on the highway. This driver saw 25.04 mpg from the test car after a 117.8-mile drive, 52 percent of which was in city-type operation. Ride and handling can put a smile back on the face of any driver frustrated by the powertrain performance. 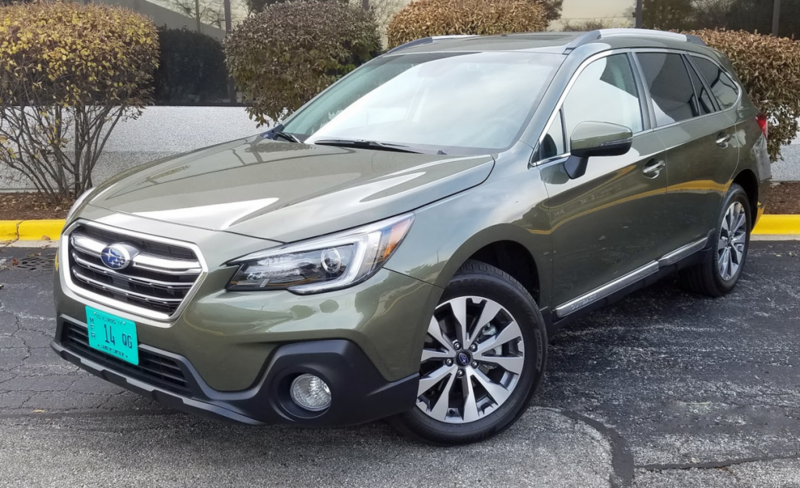 Light but not limp steering makes the Outback easy to maneuver, and active torque vectoring improves cornering control. The fully independent suspension delivers a compliant ride—surprisingly so for a near SUV. Any Outback has a roomy passenger compartment with fine driver vision. Headroom is good above all passenger positions, and doors open wide for easy passage. As the most complete model of the bunch, the Touring coddles passengers with a power moonroof, heated front and rear seats, reclining rear seat backs, and generous distribution of soft-to-the-touch interior surfaces. STARLINK in the Touring is displayed on an 8-inch touchscreen, and includes Aha and Pandora audio apps, and Bluetooth connectivity. Satellite radio and a 12-speaker Harman Kardon audio system are included as well. A tuning knob on the far side of the touchscreen from the driver’s seat simplifies selection of radio stations; a press on the screen is all that’s necessary to save them as presets. Buttons to the left of the screen activate navigation and apps. Dual-zone climate controls use twin rotary dials for temperature settings, but function settings are left to two rows of buttons that can be hard to read at a glance. For interior storage, there’s a roomy glove box and a padded-top console box that’s fairly deep and includes a shallow organizer tray. Pockets in all doors incorporate bottle holders—though the rear pockets don’t have room for much more. The console holds dual open cup holders and a bin under a pop-up door that contains auxiliary and USB ports. Rear passengers get pouches on the front seat backs, a pull-down center armrest with two cup holders, and USB ports built into the back of the console. The Outback is essentially a raised-ride-height passenger-car wagon, so its rear cargo area isn’t as tall as the average SUV’s, but it’s still very spacious– especially when the easy-to-fold rear seats are flipped down. There’s also an ample cargo area that extends well forward from the power liftgate with height memory function. Items load at bumper height on a molded mat designed to trap dirt and water. Cargo tie-downs and a power point are provided. The second-row 60/40-split seat backs can be retracted remotely via levers in the cargo area or more directly through flippers built into the seats. When folded, the seats rest almost perfectly flat with a smooth transition from the cargo floor. When the seats are down, cargo capacity more than doubles to 73.3 cubic feet. All in all, and forgiving its few obvious faults, the Subaru Outback 2.5i Touring pops up as a car built to address some otherwise unmet needs in the midsize field. You could say it’s medium, rare. The Subaru Outback offers a compelling mix of SUV and passenger-car attributes. The raised ride height and standard AWD give it all-weather/rough-terrain versatility, and it’s a bit less cumbersome to drive than some midsize SUVs can be. Written by: The Daily Drive staff on January 4, 2018.on February 25, 2019.